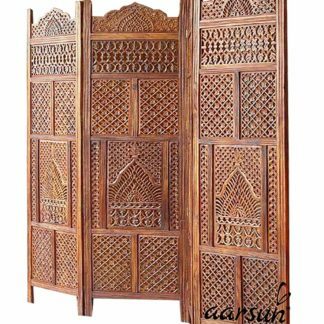 Aarsun Woods bring you this Handmade Folding Partition Screen / Room Divider made from premium quality Mango Wood with beautiful jaali design that gives an elegant and traditional look to your living room. The unit consists of 4 panels and each panel comes in a standard size of Height approx. 72 inches (6 feet) and 20 inches wide. We provide shipping to all parts of India. The packaging of the unit is done in Wooden Crate Boxes so as to avoid any damage while in-transit. We provide best possible services to all our clients and believe in strong customer relationships.